The Central Building on the south side of Richmond Street West, between Yonge and Bay Streets, c. 1928. Toronto archives, F 044, Item 0021. The Central Building at 45 Richmond Street West was not among the structures that architectural preservationists would likely have fought to save from the wrecker’s ball. Built between 1927 and 1928, it was rather plain, its facade containing few architectural ornamentations. It was an oddity for the decade in which it was constructed, as most 1920s commercial buildings tend toward a little more exuberance. Its architects were Baldwin and Greene, who also designed the Concourse Building at 100 Adelaide Street West. In contrast to the Central, it contained one of the finest Art Deco facades in the city. Today, its south facade remains much admired. If the Central Building had survived, I doubt that it would elicit the same respect and admiration that the Concourse building has generated. The Central’s architects also created the Claridge Apartments, on the southwest corner of Avenue Road and Clarendon, three blocks south of St. Clair Avenue. Its ornate Romanesque architecture, with a lobby decorations by The Group of Seven’s J. E. H. MacDonald, is a testament to the skills and artistry of Baldwin and Greene. The 12-storey Central Building was constructed of beige bricks, its north facade possessing only a few elements of Art Deco design. On the side of this facade, near the corners of the building, there were faux ancient hieroglyphs, which began on the 3rd floor and ascended to the 11th. The cornice at the top was exceedingly unornamented, but the sub-cornice below it, possessed a few interesting designs in the brickwork. However, these details were lost to those who strolled by on the sidewalks as they were too high to be seen on the narrow street where it was located. In contrast, the two-storey entrance on the ground floor was well ornamented and contained an impressive Roman arch. On the fifth floor, in a central position, was a rather odd looking bay window. There is no record of why this was included, but I assume that the room behind it had special significance, such as a board room or a chief executive’s office. The building was demolished to create a parking lot to accommodate the many cars that daily enter the city’s downtown core. I was unable to discover the date of the building’s demise, but it was likely in the 1940s or 1950s. Entrance to the Central Building at 45 Richmond Street. The doors were recessed into the archway. Toronto Archives, S 044, Item 0020. The generous use of marble, the decorative ceiling, and light fixtures reflect the best of the Art Deco period. Toronto Archives, F 044, Item 0022. Location of the Central Building at 45 Richmond Street West. 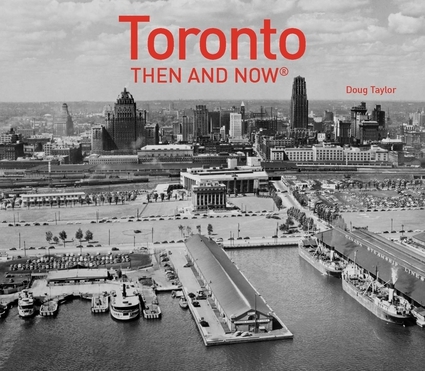 Source: “Toronto Architecture, a City Guide,” by Patricia McHugh.